Patient J is a single mother and esthetician student in her mid twenties. 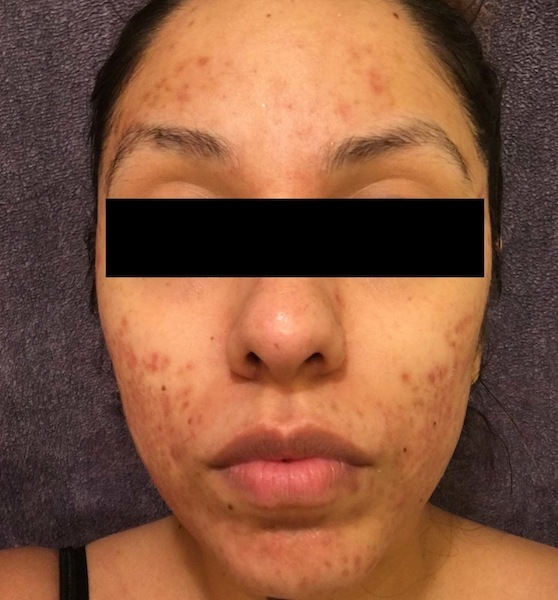 She came to see me in October of 2015 for her severe acne that had been raging on for about two months. 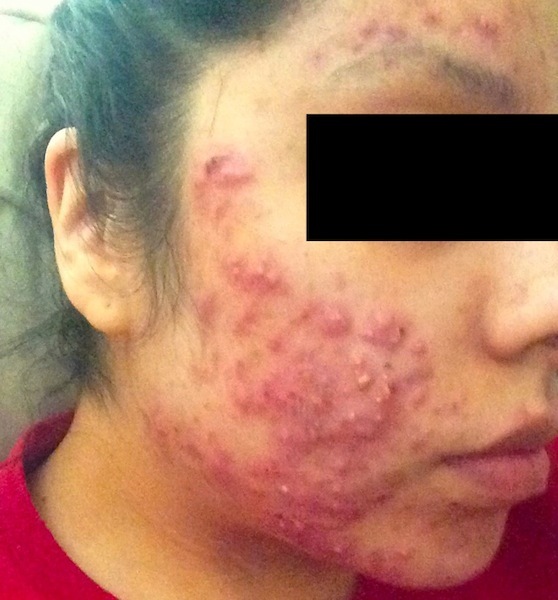 Being a hopeful esthetician, she is extremely careful with her skin and the outbreak of acne was devastating to her. Before she came to see me, she had seen a dermatologist for a while. 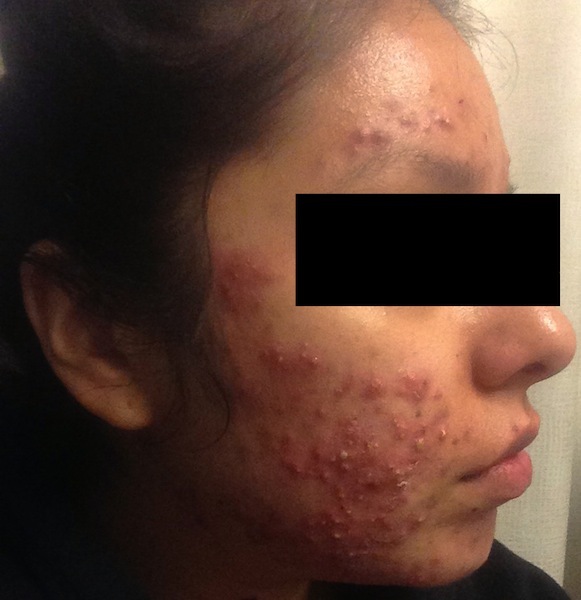 She underwent two rounds of antibiotic treatments and various topical creams. 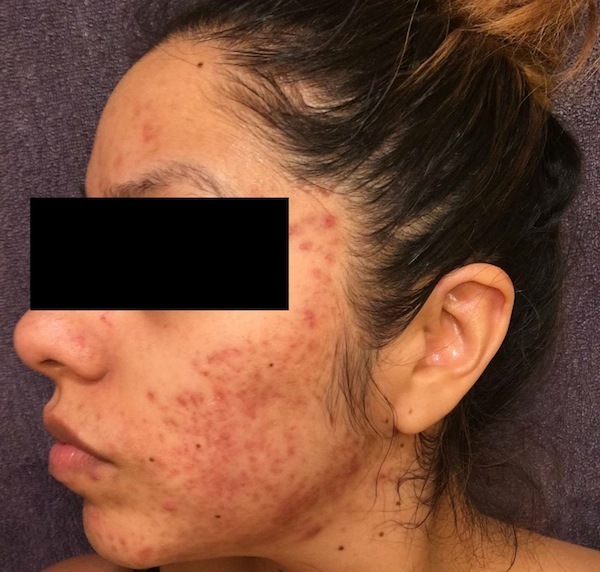 After all these treatments failed, her dermatologist suggested she try accutane. She learned that it is highly toxic so she found me after researching for alternatives on the Internet. When she first walked into my clinic, I was shocked to see her face. It was a lot worse than the pictures shown here. There was much more pus throughout her face. It looked almost like frosting on some breakfast cereals. 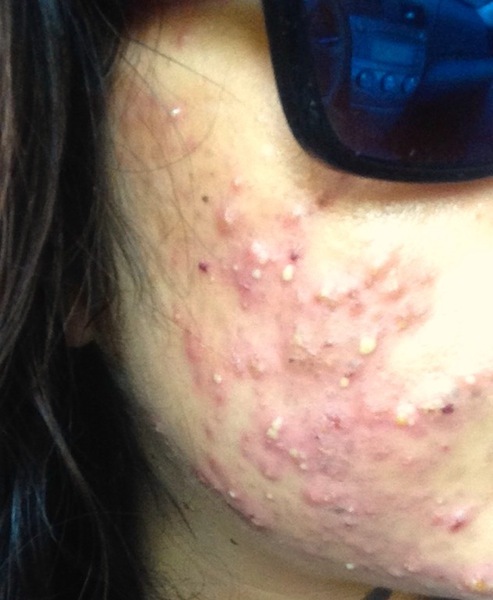 My first reaction is “this cannot be a typical acne. 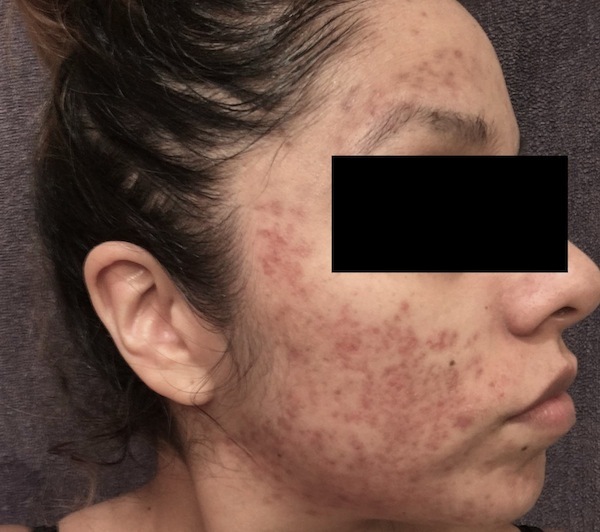 There must be an unusual underlying cause.” After interviewing her, we ruled out cosmetics because she stopped all skin products after the outbreak. We then focused on her diet. I have treated many people with skin problems and I know that it must be treated wholistically. The extreme redness indicates “heat” in Traditional Chinese Medicine. The high volume of pus indicates “dampness”. The combined “damp-heat” is most likely a result of strange diet since specialized diet is the most popular alternative medicine in America. After questioning the patient about her dietary change, we found out that she switched to using coconut oil a few months before. Coconut oil has become very popular recently despite being very high in saturated fat. Although TCM does not have the concept of saturated fat versus unsaturated fat, foods high in saturated fats are usually considered dampness and phlegm producing. In my clinic practice, I have seen several cases of skin outbreak with the use of coconut oil. It confirms my suspicion that it is a dietary source of damp-heat. I advised the patient to stop using coconut oil and prescribed her herbs that will clean the damp-heat in her system. She saw dramatic improvement just after a few days. 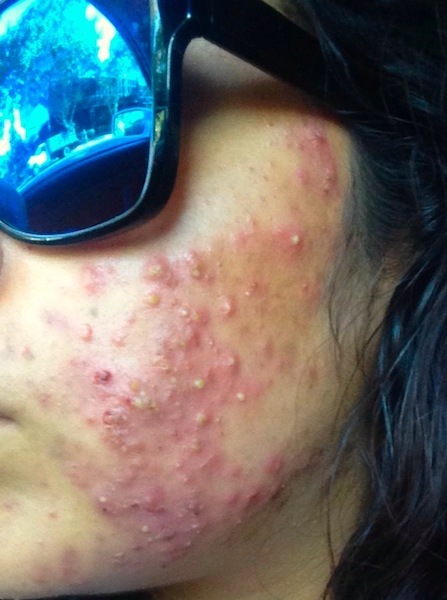 After two weeks, her acne was no longer active. I suggested the patient to continue with treatment to minimize scarring so her face can recover better. However, due to budgetary reasons, she decided to finish the treatment early. Nonetheless, she was very pleased with the result and satisfied with the resolution to her problem.